Ever since I moved into my own home almost 2 and a half years ago, I truly feel like my memory has deteriorated. Seriously. Working full time and managing a house, garden, as well as juggling a few very obsessive hobbies really does take its toll at times. I only dread to think what its like when I have children. I live with my boyfriend but being a (sorry to be so stereotypical) man, he doesn't pull his weight half as much as he should, and relies on me far too much to do and remember everything. I sometimes feel like I have a child already, but a grown up one. I swear if I left it to him, we'd go on holiday, arrive at the airport, walk up to the check in desk, and it'll only be then that he'll ask 'Have you got the passports?' He's not the best at using his initiative round the house, and has to be told time and time again to do simple things like changing light bulbs, or mowing the grass. Most times I feel like I'm thinking for him as well as myself, therefore my brain is in over-drive and probably trying to take on too much. Along with this, I am in a full time job whereby I manage my own caseload of clients, therefore I am 'in charge' if you like, of arranging their lives for them and taking on their problems too, as well as solving them. I am forever booking appointments for allsorts of things, as well as doing (and falling behind with) paperwork, databases, filing, meetings, training etc etc, therefore its safe to say that my diary really is my bible and I really would be lost without it. More so just recently, I've noticed my memory is worse than ever.. if I meet a client, I'll come back to the office and 2 hours later I really struggle to remember what we discussed. Along with storing all my appts in my diary, I have many pretty notebooks lying around the house, in my handbag, in my car.. all over, and in them will be many pages dedicated to my 'to do lists'. I have a habit of writing a list, not completing all of my tasks, but a day later writing a fresh one. Weird and such a waste of time, but true. 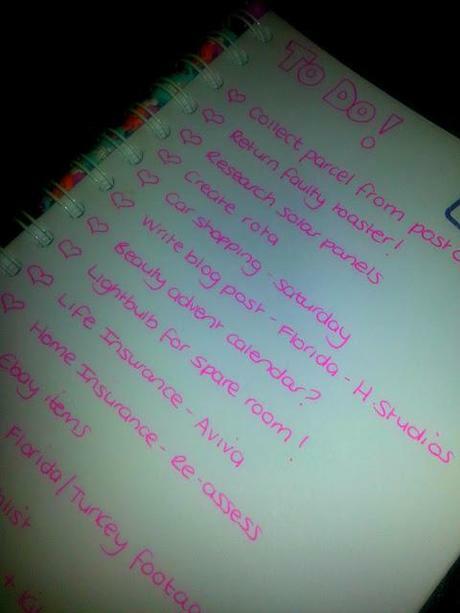 I'll let you into a little secret - I actually really enjoy writing my to do lists. For some it can be quite daunting, seeing how many tasks they have to tackle on paper in black and white, which would probably cause even more procrastination. However for me, I find it motivating. I like to see them written down, and get a tiny buzz every time I can put a big tick next to each completed one. It helps me to stop procrastinating and actually knuckle down and crack on with that horrible complicated or tedious task that I've been putting off forever. Not only that but it helps to put my mind at ease a little, knowing that those 'chunk of items' on my list are a chunk less for my brain to remember, therefore I'm not going to forget. It gives me a sense of relief as I see the list slowly being ticked away, which subsequently makes me more stress-free. I normally have 2 to do lists, one for work and another for home. I'm naughty and sometimes write my personal to do lists whilst I'm at work, just because I feel like my brain is so overloaded, I need to offload some of it to feel less anxious about everything. I also have an app on my phone that enables me to write to do lists whilst I'm on the go, which I find really handy if I need to remember anything.. Here's a little sneak peek of my current personal 'to do' list..
As you can see, its a pretty dull and tedious to do list, but that's what you get when you fly the nest. Booo! What's worse, they are never ending. Regarding the insurances, due to this being our first home, when we initially bought, being first time buyers, we were fairly naïve on everything. We paid for a mortgage advisor who sucked us into every insurance under the sun, and we agreed to it all. Its not till afterwards that I thought that we don't actually need half of the things we signed up for. We did a bit of research, cancelled a few but one things that's been on our list to do is compare our current home insurance with other providers (2.5yrs later and we still need to do this to get a cheaper quote! ), and also look into life insurance a little more. This is one that we cancelled early on because we felt it wasn't needed. Being 26 and 28 at the time, we felt it was pointless and a waste of money having it at our age, but its not till I got talking to someone who recommended not to leave it late in life before we get it because fees will be a lot higher because you become more high risk, so this is something I need to research into! Do you swear by to do lists? What's on yours for this week? This is a competition entry via www.mumsnet.com.